Do I need a flyback diode with an automotive relay? I have two relays to convert +12 volt circuits to "ground" inputs into a fuel injection ECU. 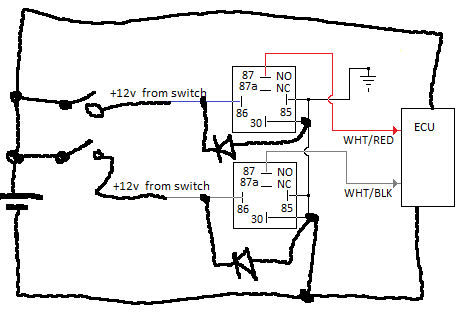 If I connect the relay coil ground to the same ground as the "source" will I need to install a diode to prevent possible fly-back to the ECU? Sometimes, relay coils are used together with switches, and no freewheeling (flyback) diodes are used. This will work, but every time you open the switch contacts, an arc will burn for a short time, which shortens the lifetime of your switches. 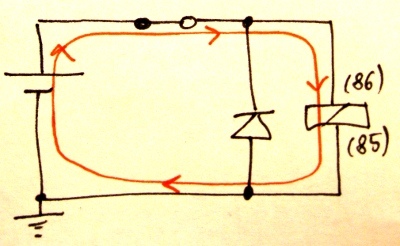 With a transistor output driving a relay, a freewheeling diode is absolutely necessary, because the voltage spike will destroy the transistor. When using a switch to turn on/off a relay, omitting the diode will work, but your switch will be happier when you use a diode (one individual diode for each relay). The best place for the diode is right at the relay, Cathode at input from switch ("86"; in case you switch the + end, which is indicated in your diagram) and anode at GND ("85"). Good diodes for this purpose are those of the fast switching type, e.g. 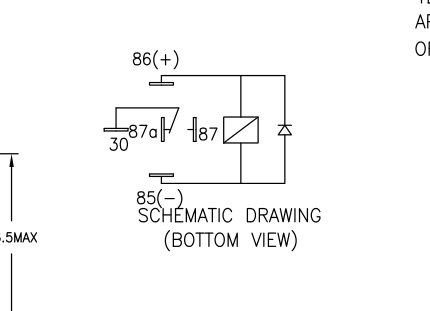 a 1 A / >=50 V Schottky barrier. A SB160 or SB1100 or similar will likely be o.k. Note that on automotive supply rails, there are often high voltage / high energy spikes caused by turning off other inductive loads. Therefore allowing some safety margin and using a 100 V diode won't hurt. Those parts are cheap anyway. Please make sure that this diagram is correct (relay coil between 86/85, common contact at 30, NO at 87, NC at 87a). Also confirm that the GND (chassis) connections are o.k. like drawn here. You say you are worried about damage to the ECU. Since the battery is not a perfect voltage source, the flyback pulse will lift the positive end of the battery somewhat, and there may be a spike. However, in a car, there are loads much worse than a relay, causing much higher spikes. Any good automotive gadget should tolerate these spikes. You need the flyback diodes because at the instant you open the switch, a relay's inductance will try to maintain the current. Adding a diode will create an easy path for this current to circulate until the relay's inductance has lost all its energy. Note how the direction of the current in the relay itself does not change and satisfies the rule that an inductance does not allow a rapid discontinuity of its current. I'm using automotive relay TE 1432793-1, which is a SPDT Panel Mount Non-Latching Relay, 12V. You can get it from RS Components. 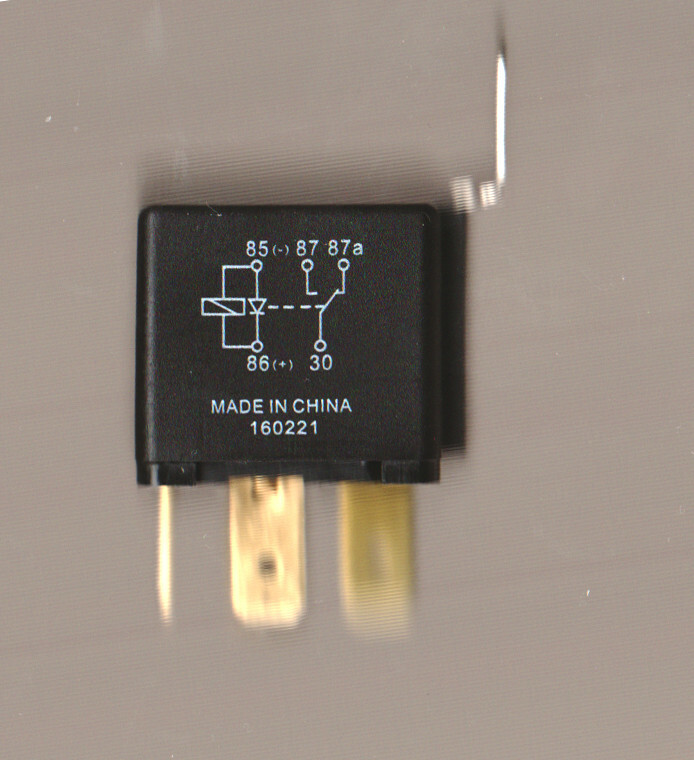 The relay has this following diagram on it's side. 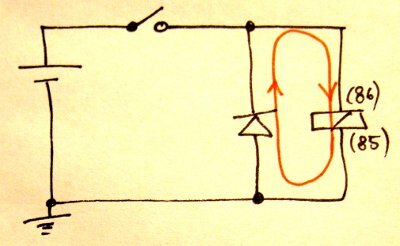 You can see that the diagram even gives a polarity for connection, which is only necessary in a relay's case if there is a protection diode. Also, it's data sheet is shown below. Both clearly indicate that the relay has a protection diode built in. So in this case, my answer is no. You do not need a flyback diode with all automotive relays. Not the answer you're looking for? Browse other questions tagged relay diodes protection or ask your own question. Can I add flyback diodes to my car window motors? Do I need a protection diode here? 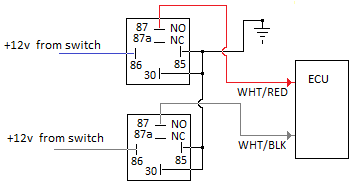 Can a relay use both a flyback diode AND resistor for voltage suppression?